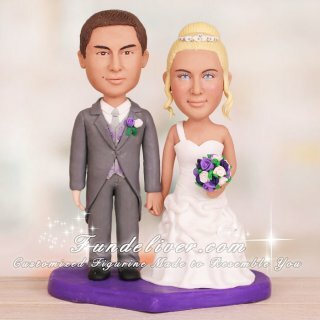 This is a completely customized traditional bride and groom wedding cake topper ordered by one of our customers. Their color scheme is purple and lilac. The bride has blonde hair and would like it in a bun with curly sides and a simple tiara on the model and has blue eyes and the groom has dark brown hair with blue eyes. Also they would like for the flowers to be purple and lilac roses, holding by the bride, standing with groom on a purple heart shaped base to match their wedding scheme.